Evening visit until 11pm close. The tub of Goacher's 1066 remains unbroached and still used to tease. Evening visit until 11pm close. Pure serendipity to find Goacher's 1066 still on sale. Evening visit until 11pm close. I had a premonition that the 1066 might be on! Evening visit until 11pm close. 9s of Kent Amarillo and Bexley Red House had already been emptied from start to finish here today. The pub is found in Eltham, Greater London, SE9 1UT. Micropub located in a former plumbing supplies shop in Westmount Road in the parade of shops adjacent to the former entrance to the now closed Eltham Park railway station. An area previously devoid of pubs at the wish of the estate builder at the time. Expected to open in December 2014 and did, in fact, open on cue on Friday 12th December 2014 at 5 pm. 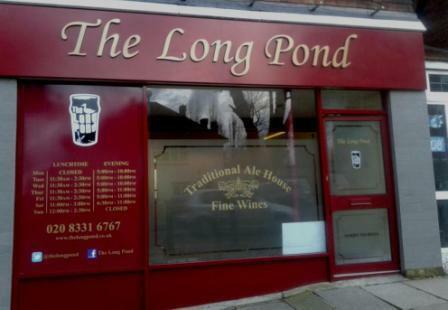 Named after the Long Pond in Eltham Park North, a short walk away. 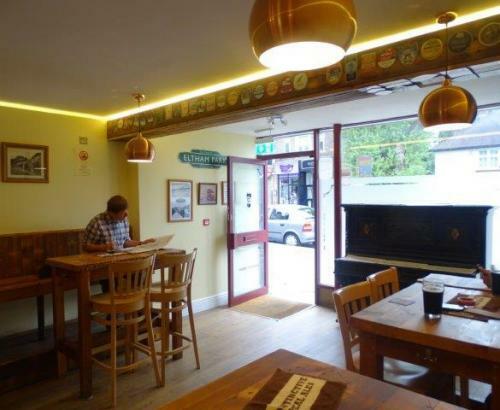 There are 4-6 local real ales and cider served on gravity dispense from a chilled stillage room which may be viewed through a window behind the bar counter. There is also real cider and perry. At the front seating is on high wall mounted benches and high tables. To the left rear is a low tables and chairs seated area called "The Dorchester Room". A corridor leads to the toilets at the very back and is usually packed with full and empty casks. 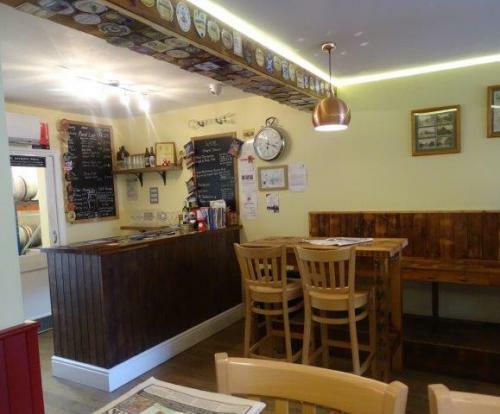 Local CAMRA branch runner-up Pub of the Year 2016. Local CAMRA branch Pub of the Year 2017 and local CAMRA branch Cider Pub of the Year 2017 too. The house beer Pond Life is Tonbridge Traditional. 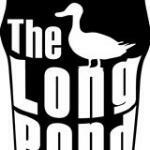 We have visited this pub 91 times, seen 238 different beers and tried 121 of them.